Faridah Djellal is Professor of Economics, former Dean of the Faculty of economics and soci-ology, Director of a master degree in services economics and management and member of the academic council of Lille University. She is currently President of the “Innovation, Labour” Committee at ANR, the French National Research Agency. She is member of RESER (Europe-an Association for Research on Services) and Vice-President (in charge of cooperation) of RNI (Research Network on Innovation). She is associate editor of the European Review of Service Economics and Management and member of the editorial boards of several scientific journals (including Journal of Innovation Economics and Management, Business and Innovation, Re-view of Business and Economics Studies, Bulgarian Economic Papers). Faridah Djellal is the author or co-author of more than 80 articles in scientific journals or books and of 11 books. Camal Gallouj, Professor, University of Paris 13. Camal Gallouj is Professor of Management Sciences at the University of Paris 13 Sorbonne City. He is member of RESER and of several other academic associations including French Marketing Association (AFM) and French HRM association (AGRH). He is also at the board of the RNI (Research Network on Innovation). Camal Gallouj’s field of interests include inno-vation in services, HRM in services, management of services. More recently he has been in-volved in research projects dealing with emerging markets and has published on retailing and tourism in Morocco and North Africa. Camal Gallouj is at the editorial board of 7 journals and associate editor of the European Review of Service Economics and Management. He is the au-thor of more than 50 articles in academic journals and has published or edited 15 books to date. He is also qualified as an academic expert within the French national council for retailing ac-counts. 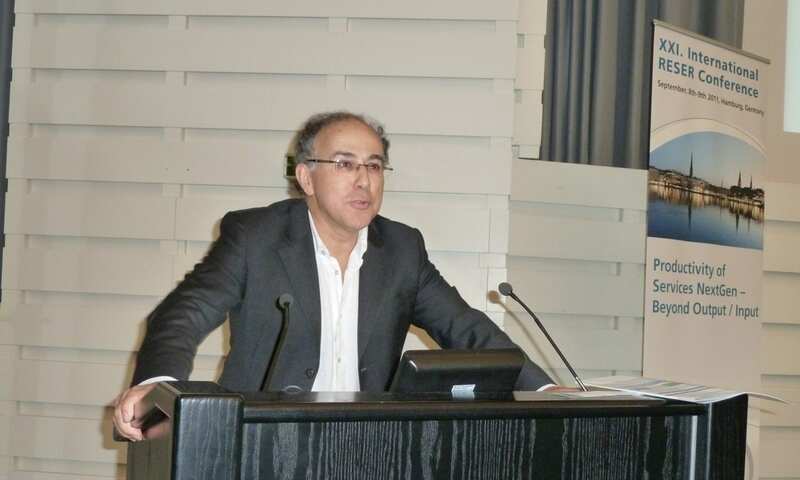 Faïz Gallouj is Professor of Economics, Director of a master degree in innovation economics and management and member of the scientific Council of Lille University. He is member of RESER (European Association for Research on Services) and of RNI (Research Network on Innovation). He is the Editor-in-Chief of the European Review of Service Economics and Man-agement (formerly « Economies et Sociétés » Economics and Management of Services Series) http://ersem.univ-lille1.fr/. He is member of the editorial or scientific boards of 14 journals mainly devoted to services or innovation (including Research Policy, Service Science, the Jour-nal of Innovation Economics, the European Journal of Innovation management). He has au-thored or co-authored 155 articles that have been published in scientific journals and books and 35 research reports for different national and international institutions (including OECD, Euro-pean Commission: SI4S, TSER programme; DG entreprise; ServPPIN, 7th FP; Co-Val, H2020, etc.). Faïz Gallouj is also the author, co-author or editor of 17 books on services and innovation. Benoît Desmarchelier is Associate Professor in Economics at the University of Lille. Previ-ously, he was Lecturer in Economics at Xi’an Jiaotong-Liverpool University. Benoît’s research efforts focus at understanding complex systems dynamics in order to get new insights on the drivers of aggregate economic phenomena (e.g. economic growth, structural change, or the emergence of innovation systems and creative milieu). Benoit has published papers on these topics in top journals, including Journal of Economics Behavior and Organization, Kyklos, Journal of Evolutionary Economics, Technological Forecasting and Social Change. Céline Merlin-Brogniart is Associate Professor in Economics at the University of Lille. She was previously Assistant Professor at the University of Angers. Celine is Secretary of RESER (European Association for Research on Services) and member of the Editorial Board of several scientific journals. She is also scientific advisor for the French Committee for Service Accounts. She was involved in several National and European projects on services and innovation (includ-ing the ServPPIN project). Her main fields of teaching and research include Service innovation, Public Services, Public-Private Partnerships, Entrepreneurship, Sustainable Development. Fedoua Kasmi, Ecologie industrielle et milieu éco-innovateur (supervisors B. Laperche and C. Merlin-Brogniart. The University of Lille has been officially created on January 1st, 2018, as a result of the com-mon desire of the three universities of Lille to build a leading European university, recognized worldwide for its research, the excellence of its education and its innovative lifelong training. The ULille is a multidisciplinary university, covering 4 training areas: Sciences and Technolo-gies; Life Sciences and Health; Arts, Literature, Languages, Human and Social Sciences; Law, Economics and Management. Research plays an essential role at ULille, which enjoys strong ties with leading bodies such as CNRS, INSERM, INRIA, Pasteur Lille and Lille University Hospital. The ULille policies aim to reinforce the inter-disciplinary research, in line with major social issues, knowledge transfer and public-private partnership. Key figures: 67000 students; more than 520 degree diploma in Science, Technology, Engineering, Law, Health, Economics, Management, Languages, Human and Social Sciences, including 24 degrees fully taught in Eng-lish; more than 40 research units; 3300 lecturers and researchers; 350 tenured and post-doctoral researchers; 11 ERC grantees; 2000 Doctoral Researchers, 6 Doctoral Schools; over 3000 sci-entific publications each year. The University of Lille has been involved in more than 100 European research projects. A rich network of collaborations with leading establishments and teams around the world (more than 25 Associated or Joint Laboratories) reflects ULille potential in collaborative research and training projects. Founded in 1982, CLERSE is a Joint Research Unit (UMR 8019) between the University of Lille and the National Center for Scientific Research (CNRS). It is compounded of more than one hundred researchers, mainly economists and sociologists. Funded projects on services issues carried out by he members of the »Services and Innovation« group include: innovation and R&D in insurance companies, the measurement of R-D in service industries, innovation in public services, productivity evaluation in Family Allowance Offices, models of tourism and local development, Performance and innovation in the French Post Of-fice, innovation in hospitals, ICT in Education, productivity in public services, Ageing in a ser-vice economy, Public-Private innovation networks in services, Value co-creation in public services. These project were carried out for the for the following institutions: Ministries of Research and Technology, of Education, of Employment and Solidarity, of SMEs, Department of Commerce, Direction of Tourism, Commissariat Général du Plan, Regional Council, Chamber of Commerce and Industry, OECD, European Commission (several projects including the SI4S project, TSER programme; DG Entreprise, Innovation and SMEs programme; Dynamo project, 6th FP, ServPPIN project 7th FP, CO-VAL H2020), etc. The researchers involved in the project participate in various institutions interested by the dy-namics of public and private services: French Committee for Service Accounts, French Council for Statistical information, piloting committees dedicated to services measurement problems within INSEE, OECD, and within different Ministries, etc. They are members of several international scientific networks on services and on innovation. One of the researchers is expert within ANR, the French National Research Agency. The European Review of Service Economics and Management (ERSEM) is an international multdisciplinary Journal which publishes in English or in French papers on services sector, ser-vice organisations and service functions. It is edited by Lille team together with other RESER partners. Djellal F., Gallouj F. (2018), Fifteen challenges for service innovation studies, in Djellal F., Gallouj F. (eds), A Research Agenda for Service Innovation, Edward Elgar Publishers. Djellal F., Gallouj F. (2018), Services, service innovation and the ecological challenge, in in GALLOUJ F. DJELLAL F. (eds), A Research Agenda for Service Innovation, Edward Elgar Publishers. Merlin-Brogniart, C. (2017), Nature et dynamique de l’innovation des nouveaux modèles de croissance : le cas de l’écologie industrielle et de l’économie de la fonctionnalité, Innovations, Revue d’Economie et de Management de l’Innovation, Innovations, n° 54, 2017/3, Changement climatique Potentiel d’innovations, pp. 65-95. Laperche, B., Merlin-Brogniart, C. (2016), Ecologie industrielle et développement territorial durable : le rôle des services, Marché et Organisations, 25(1), 2016, pp.87-118. Djellal F. Gallouj F. (2016), Service innovation for sustainability, in Toivonen M. (ed) “Service innovation: novel ways of creating value in actor systems”, Springer. Desmarchelier B., Djellal F. Gallouj F. (2016), KIBS and the Dynamics of Industrial clusters: a complex adaptative systems approach, in J. Ferreira, C. Fernandes, M. Raposo and M. Dejardin (eds), Knowledge Intensive Business Services and RegionalCompetitiveness, Routledge. Gallouj F., Djellal F. (2016), Open innovation: the different pathways towards openness, in Richardson D. (ed), The International Encyclopedia of Geography: People, the Earth, Environment, and Technology, John Wiley and sons. Windrum P., Schartinger D., Rubalcaba L., Gallouj F., Toivonen M. (2016), The Co-Creation of Multi-Agent Social Innovations: A Bridge Between Service and Social Innovation Research, European Journal of Innovation Management. Morrar R., Gallouj F. (2016), The growth of the service sector in Palestine: the productivity challenge, Journal of Innovation Economics & Management, 2016/1, n°19, p. 179-204. Gallouj F., Djellal F. (2015), Introduction, in Gallouj F., Djellal F. (eds), Services and Innovation, The International Library of Critical Writings in Economics series, Edward Elgar Publishers, p. 5-20. Merlin-Brogniant C., Moursli-Provost A-C., (2015), Trajectories Of Innovation In The Health Care Sector: The Case Of Belgian Nursing Homes, Journal of Inspiration Economy, Volume 2 Issue 1 (March 2015), pp.43-67. Cruz S., Paulino S., Gallouj F.. (2015), Innovation in Brazilian landfills: A ServPPIN perspective, Economics and Policy of Energy and Environment, 3, p. 79-100. Hyytinen K., Ruutu S., Nieminen M., Gallouj F., Toivonen M. (2015), A system dynamic and multi-criteria evaluation of innovations in environmental services, Economics and Policy of Energy and Environment, 3, p. 29-52. Djellal F., Gallouj F. (2015), Services and crisis: stop shooting the ambulance! Journal of Innovation Management, 3(1), p. 5-8. Cruz S., Paulino S., Gallouj F. (2015), Public Service Innovation: Solid Waste Sector from the Perspective of Clean Development Mechanism Landfill Projects, Journal of Inspiration Economy, Issue 2(2), September, p. 93-112. Fourcroy C., Gallouj F., Decellas F. (2015), “La matérialité invisible des services et ses implications énergétiques : une estimation de l’énergie grise par la méthode input-output”, Revue d’économie industrielle, n°149, 1er trimestre, p. 43-73. Djellal F., Gallouj F. (2015), Green and sustainable innovation in a service economy, in Bryson J.R. and Daniels P. (eds), The Handbook of Service Business: Management, Marketing, Innovation and Internationalization, Edward Elgar Publishers, p. 83-104. Gallouj F., Weber M., Stare M., Rubalcaba L. (2015), The future of the service economy in Europe: a foresight analysis, Technological Forecasting and social Change, 94 (May), p. 80-96. Gallouj F., Merlin-Brogniart C., Moursli-Provost A.-C. (2015), Les partenariats public-privé et leur place dans l’innovation hospitalière : quels enseignements pour le management hospitalier ? Innovations – Revue d’économie et de Management de l’Innovation2015/1, n° 46, p. 161-195. Gallouj F., Stankiewicz F. (2014), “Présentation de l’ouvrage”, in Gallouj F., Stankiewicz F. (eds), Le DRH innovateur : management des ressources humaines et dynamiques d’innovation, PIE Peter Lang, p. 11-20. Gallouj F. (2014), Inspiration Economy: a New Journal, Journal of Inspiration Economy, 1(1), September, p. 7-13. Merlin-Brogniart C. (2013) « corporate entrepreneurship », in Carayannis, E. (ed. ), Encyclopedia of Creativity, Invention, Innovation and Entrepreneurship, New York, Springer, 2800p, pp253-259. Gallouj F., Rubalcaba L., Windrum P. (eds) (2013), Public-Private Innovation Networks in Services: the dynamics of cooperation in service innovation, Edward Elgar Publisher. Gallouj F., Rubalcaba L., Windrum P. (2013), “Public-private innovation networks in services (servPPINS)”, in Gallouj F., Rubalcaba L., Windrum P. (eds), Public-Private Innovation Networks in Services, Edward Elgar publishers, p. 1-18. Gallouj F., Rubalcaba L., Windrum P. (2013), “Conclusions and agenda for future research”, in Gallouj F., Rubalcaba L., Windrum P. (eds), Public-Private Innovation Networks in Services: the dynamics of cooperation in service innovation, Edward Elgar publishers, p. 462-485. Djellal F., Gallouj F. (2013), “How public-private innovation networks in services (ServPPINs) differ to other innovation networks: What lessons for theory?” in Gallouj F., Rubalcaba L., Windrum P. (eds), Public-Private Innovation Networks in Services: the dynamics of cooperation in service innovation, Edward Elgar publishers, p. 21-58. Gallouj F., Merlin-Brogniart C., Moursli-Provost A.-C. (2013), “Public-Private Partnership in hospital innovation: implication for hospital management”, in Gallouj F., Rubalcaba L., Windrum P. (eds), Public-Private Innovation Networks in Services: the dynamics of cooperation in service innovation, Edward Elgar publishers, p. 265-302. Labarthe P., Gallouj F., Djellal F. (2013), “Effects of institutions on the integration of end-users’s knowledge in ServPPINs: lessons from two case studies in agro-environmental knowledge intensive services”, in Gallouj F., Rubalcaba L., Windrum P. (eds), Public-Private Innovation Networks in Services: the dynamics of cooperation in service innovation, Edward Elgar publishers, p. 303-325. Djellal F. Gallouj F., Miles I. (2013), Two decades of research on innovation in services: Which place for public services? Structural Change and Economic Dynamics, Vol. 27, December, 98-117. Gallouj F., Zanfei A. (2013), Innovation in public services: Filling a gap in the literature, Structural Change and Economic Dynamics, Vol. 27, December, 89-97. Labarthe P., Gallouj F., Laurent C., (2013), Privatisation du conseil et évolution de la qualité des preuves produites pour les agriculteurs, Economie rurale, 337, septembre-octobre, p.7-24. Desmarchelier B., Gallouj F. (2013), Endogenous growth and environmental policy: are the processes of growth and tertiarisation in developed economies reversible? An evolutionary perspective, Journal of Evolutionary Economics, 23(4), p. 831-860. Djellal F., Gallouj F. (2013), The productivity challenge in services: measurement and strategic perspective, The Service Industries Journal, Vol. 33, n°3-4, February, p. 1-18. Desmarchelier B., Djellal F., Gallouj F. (2013), Environmental policies and eco-innovations by service firms: an agent-based model, Technological Forecasting and Social Change, 80 (7), p. 1395-1408. Desmarchelier B., Djellal F., Gallouj F. (2013), Knowledge intensive business services and long term growth, Structural Change and Economic Dynamics, 25, p. 188-205. Stare M., Gallouj F. (2013), Seizing the opportunities of service innovation, in High Level Economic Expert Group ‘Innovation for Growth-i4g’ (ed) “Inclusive Innovation” and “Service Innovation”, p. 61-75, European Commission, Luxembourg: Publications Office of the European Union. Gallouj F. (2013), Services: innovation, performance and public policy, in High Level Economic Expert Group ‘Innovation for Growth-i4g’ (ed) “Inclusive Innovation” and “Service Innovation”, p. 77-115, European Commission, Luxembourg: Publications Office of the European Union. Djellal F., Gallouj F. (2013), “Les réseaux d’innovation public-privés dans les services : au-delà de la conception industrialiste et technologiste des réseaux”, in Boutillier S., Djellal F., Uzunidis D. (eds), « L’innovation : analyser, anticiper, agir », Peter Lang, p. 419-438. Gallouj C., Gallouj F. (2013), “Services and regional development policies: the French case?” In Cuadrado Roura J. R. (ed. ), Regions and the Service Industries activities, Springer, p. 425-447. Djellal F., Gallouj F. (2013), “The new forms of entrepreneurship in a sustainable knowledge-based service economy”, in Carayannis E. G. (ed), Encyclopedia of Creativity, Invention, Innovation, and Entrepreneurship, Springer, p. 1376-1381. Djellal F., Gallouj F. (2012), L’innovation dans les services: une innovation (plus) verte ? in Boutiller S., Djellal F., Gallouj F., Laperche B., Uzunidis D. (eds), L’innovation verte, Peter Lang, p. 69-95. Fourcroy C., Gallouj F., Decellas F. (2012), Energy consumption in service industries: challenging the myth of non-materiality, Ecological Economics, Vol. 81, September, p. 155-164. Djellal F., Gallouj F. (2012), Innovation sociale et innovation de service : première ébauche d’un dialogue nécessaire, Innovations – Cahiers d’économie de l’innovation, n°38, 2012/2, p. 37-66. Gallouj C., Gallouj F. et Vigliano M.-H. (2012), Au-delà de la productivité : les multiples mondes de la performance dans le commerce, Marché et Organisations, n°15, p.67-90. Djellal F., Gallouj F. (2012), Social innovation and service innovation, in Franz H.-W., Hochgerner J., Howaldt J. (eds) 2012, Challenge Social Innovation Potentials for Business, Social Entrepreneurship, Welfare and Civil Society, Berlin: Springer, p. 119-137. Gallouj C., Gallouj F., Abidi Barthe A. (2012), “Manager l’innovation par le service: un levier pour sortir de la crise”, in Meyronin B. et Munos A. (eds) (2012), Manager l’innovation par le service: un levier pour sortir de la crise, Presses Universitaires de Grenoble, p. 197-222. Jakubowski S., Merlin-Brogniart C. (2012), « Des services publics marchands et non marchands « soutenables » ? », in Richez-Battesti Nadine, Petrella Francesca, Gianfaldoni Patrick (dir. ), Travail, organisations et politiques publiques : quelle « soutenabilité » à l’heure de la mondialisation ?, Cahiers du CIRTES, Hors-série #2, Presses universitaires de Louvain, pp. 287 à 302. Merlin-Brogniart C. (2011), « Intrapreneuriat et services publics marchands en réseau : Le cas de La Poste », in “PME, dynamiques entrepreneuriales et innovation”, ed. Abdelillah Hamdouch, Sophie Reboud et Corinne Tanguy, Peter Lang, coll. Business and Entrepreneurship, Bruxelles, (à paraitre, décembre). Depret M.-H., Merlin-Brogniart C., (2011), « La responsabilité globale des entreprises du service public marchand : Vers un élargissement de la notion de responsabilité sociale et environnementale » La rse : une nouvelle régulation du capitalisme, Publication presses du septentrion, coll “capitalismes éthique institutions” sous la dir de Postel, Chavy, Cazal, Sobel, mars. Merlin-Brogniart C., (2011) « Mondialisation et rationalisation des services publics : le cas des services postaux français » Chapitre. 9, in L’entreprise dans la mondialisation. Contexte et dynamiques d’investissement et d’innovation, Coordonné par Dimitri Uzunidis, Blandine Laperche, Sophie Boutillier, ed Le Manuscrit. Gallouj F., Toivonen M. (2011), Elaborating the characteristics-based approach to service innovation: making the service process visible, Journal of Innovation Economics, 2011/2, n°8, p. 33-58. Djellal F., Gallouj F. (2011), Innovation dans les services, performance et politique publique, Economie Appliquée, Tome LXIV, n°2, juin, p. 53-89. Desmarchelier B., Djellal F., Gallouj F. (2011) Economic growth by waste generation: the dynamics of a vicious circle,Lecture Notes in Economics and Mathematical Systems, 652, p. 129-138.
den Hertog P., Gallouj F., Segers J. (2011), Measuring innovation in a ‘low tech’ service industry: the case of the Dutch hospitality industry, The Service Industries Journal, Volume 31, Issue 9, p. 1429 – 1449. Djellal F., Gallouj F. (2010), Invisible innovation and hidden performance in services: a challenge for public policy, Intereconomics, Review of European Economic Policy, 45 (5), p. 278-283. Djellal F. Gallouj F. (2010), Services, innovation and performance: general presentation, Journal of Innovation Economics, n°5, 2010/1, p. 5-15. Djellal F. Gallouj F. (2010), Beyond Productivity Strategies in Services, Journal of Innovation Economics, n°5, 2010/1, p. 89-104. Djellal F., Gallouj F. (2010), “Innovation in services and sustainable development”, in P.P. Maglio, C.A. Kieliszewski, et J.C. Spohrer(ed), The Handbook of Service Science, Springer, 533-557. Gallouj F., Savona M. (2010), “Towards a theory of innovation in services : a state of the art”, Chapter 1 inGallouj F., Djellal F. (eds) (2010), The Handbook of Innovation and Services : a multidisciplinary perspective, Edward Elgar Publishers, p. 27-48. Gallouj F., Djellal F. (2010), “Filling the innovation gap in the service economy, introductive chapter in Gallouj F., Djellal F., (eds) (2010), The Handbook of Innovation and Services: a multidisciplinary perspective, Edward Elgar Publishers, p. 1-23. Gallouj, F., Djellal, F. Gallouj, C. (eds.) (2010) Handbook of Innovation and Services, Chapter 1, pp. 27-48 Cheltenham, UK, Edward Elga. Merlin-Brogniart C, (2010), «The integration of sustainable development in for-profit public service networks in France. The case of the postal and energy field (GDF, EDF)»,Journal of innovation Economics n°5 intitulé Innovation and Performances in the service sector. Merlin-Brogniart C., Moursli-Provost A-C., (2010), Les dynamiques de l’innovation au sein des maisons de repos: le cas d’un établissement associatif, Économies et Sociétés (série EGS), 44(2):197-230. Merlin-Brogniart C., Moursli-Provost A-C., (2010). Les trajectoires d’innovation dans le secteur des maisons de repos. In Transformations et innovations économiques et sociales en Europe : quelles sorties de crise ? Regards interdisciplinaires, Ed. by Degrave, F., Desmette, D., Mangez, É., Nyssens, M., Reman, P., XXXes journées de l’Association d’Économie Sociale, Presses universitaires de Louvain, Vol. 2:149-168. Depret M.-H., Le Masne P., Merlin-Brogniart C., (2009) « De la responsabilité sociale des acteurs »,Marché et Organisations,n°8, numéro intitulé Développement durable : La responsabilité sociale des acteurs. Depret M.-H., Le Masne P., Merlin-Brogniart C., (2009), Présentation générale « La responsabilité sociale des acteurs, un concept multiforme », Marché et Organisations n°8, numéro intitulé Développement durable : La responsabilité sociale des acteurs. Merlin-Brogniart C., (2007) « Compétitivité, Innovation et Services publics marchands » Revue Innovations ; Cahiers d’Economie de l’Innovation (ICEI) n°25, éd de Boeck, Bruxelles, février. Merlin-Brogniart C., (2007), « Les services publics en réseau face aux défis de la globalisation : les innovations de compromis » in “Mondialisation des services, innovation et dynamiques territoriales », ouvrage collectif, édité sous la direction de M.- C. Monnoyer et P. Ternaux, collection ” La Librairie des Humanités” éd. L’Harmattan. Merlin C., (2006), Les services publics en mutation, La Poste innove, collection L’esprit économique, éd L’Harmattan. Burmesister A., Djellal F. (2004), L’impact des technologies de l’information et de la communication sur l’organisation spatiale des activités de services, Cahiers de l’économie de l’innovation, n°19, janvier. Djellal F., Gallouj F. and C. (2004), L’hôpital innovateur : de l’innovation médicale à l’innovation de service, Editions Masson. Djellal F., Gallouj F. et C. (2004), De l’hôpital fonction de production à l’hôpital service complexe et nœud de réseau : les différentes facettes de l’innovation hospitalière, Revue Française des Affaires Sociales, n°1. Aldo Geuna, Patrick Llerena, Mireille Matt and Maria Savona , ‘Collaboration between a research university and firms and other institutions’ in: Cesaroni, F., A. Gambardella and W. Garcia Fontes (eds.) (2004) R&D, Innovation and Competitiveness in the European Chemical Industry Boston, Dordrecht, London, Kluwer Academic Publishers, pp. 145-173. Gallouj C. 2004 : Innovation et trajectoires d’innovation dans le grand commerce : une approche lancastérienne, Innovations, Cahiers d’Economie de l’Innovation, n° 19, p. 75-99. Gallouj C. 2004 : L’offre commerciale face à l’usage des temps des ménages, quelles adaptations réciproques, in Bondue J. P. (ed. ), Temps des courses, courses des temps. Djellal F., (2002), Innovation Trajectories in the Cleaning Industry, New technology work and employment, Vol 17, n°2, summer. Djellal F., (2002), Les incidences des technologies et des NTIC sur l’emploi et la qualification dans le secteur du nettoyage, Formation-Emploi, n°55. Djellal F., Gadrey J., (2002), Analyse statistique de l’emploi du secteur HCR et de ses déterminants in Gadrey J. (ed. ), Hôtellerie-restauration : héberger et restaurer l’emploi, La Documentation Française. Gadrey J., Gallouj F. (eds) (2002), Productivity, Innovation and Knowledge in Services, Edward Elgar. Gallouj F. (2002), Innovation in services and the attendant old and new myths, Journal of socio-economics, Vol. 31, p. 137-154. Gallouj F. (2002), Interactional innovation : a neoschumpeterian model, in Sundbo J. et Fuglsang L. (eds), Innovation as strategic reflexivity, Routledge, p. 29-56. Gallouj C. 2001 : Das Aubry gesetz und die folgen : arbeitszeitverkürzung in Frankreich, dans Becker U. (ed), weniger arbeit- arbeit fûr alle ? Hans Böckler stiftung,, Editions Sigma. Gallouj C. 2001 : Réduire la TVA et les charges sociales : quelles incidences ? (with Gadrey), in Gadrey et al. Hôtellerie-restauration: héberger et restaurer l’emploi, La documentation française. Djellal F., Gallouj F. (2001), L’organisation du processus d’innovation dans les services : les résultats d’une enquête postale, Education et Formations, n° 33, Juin. Djellal F., Gallouj F. (2001), Patterns of innovation organisation in service firms : postal survey results and theoretical models, Science and Public Policy, Vol. 28, n°1, p. 57-67. Djellal F., (2000), The rise of information technologies in non informational services , Vierteljahrshefte zur wirtschaftsforschung, n°69-4, janvier, n°spécial. Djellal F. (2000), Technologies de l’information et services non informationnels , Economie et Sociétés, série EGS, n°2, Avril-Mai-Juin. Djellal F., Gallouj F. (2000), “ Le casse-tête ” de la mesure de l’innovation dans les services : enquête sur les enquêtes, Revue d’économie industrielle, n°93, 4ème trimestre. Gallouj F. (2000), Beyond technological innovation : trajectories and varieties of service innovations, in Boden M., Miles I. (eds), Services and the knowledge based economy, Continuum, p. 129-145. Gallouj F., Gallouj C. (2000), Neo-Schumpeterian perspectives for Innovation in Services, in Boden M., Miles I. (eds), Services and the knowledge based economy, Continuum, p. 21-37. Djellal F., Gallouj F. (1999), L’innovation dans les services, les premiers résultats d’une enquête postale exploratoire, in ANRT, L’innovation dans les services : une invitation à l’insurrection intellectuelle, Editions Economica. Djellal F., Gallouj F. (1999), Services and the search for relevant innovation indicators : a review of national and international surveys, Science and Public Policy, Vol. 26, n°4, August, p. 218-232. Sundbo J., Gallouj F. (1999), Innovation as a loosely coupled system in services, International Journal of Services Technology and Management, Vol. 1, n°1, p.15-36.